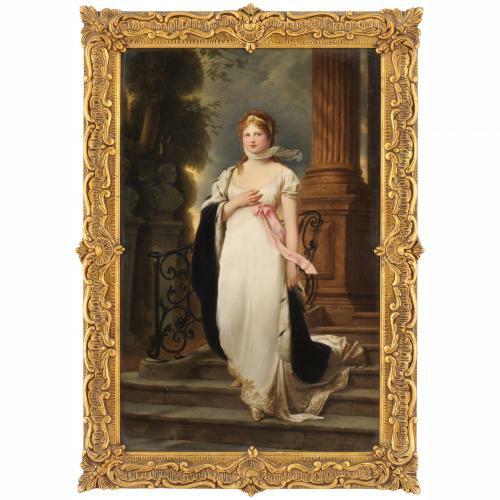 This beautiful KPM porcelain plaque replicates an extremely famous painting of Louise of Mecklenburg-Strelitz, the celebrated 19th Century Prussian Queen. This fantastic work is one of many examples of the fine porcelain replicas of important paintings produced by the celebrated Berlin-based KPM factory. It is an intriguing piece of German history as well as a beautifully rendered painting on porcelain. The original painting, after which this plaque has been made, is a work by the famed 19th Century German artist Gustav Karl Ludwig Richter (1823-1884) which now hangs in the Museum of Cologne. Richter was renowned especially for his finely detailed portraits, which made him a favourite of the Prussian court, and of the Prussian Kings Frederick William III and Frederick William IV. The subject of this portrait is the Duchess Louise of Mecklenburg-Strelitz (1776-1810), the famed Queen consort of Prussia and the wife of King Frederick William III (1770-1840). Louise was popular among her subjects and was famed, in particular, for negotiating with Napoleon following the war of 1807. Here she is shown looking powerful, majestic and determined, and standing on the steps of the Charlottenburg Palace in Berlin, official residence of the Prussian royalty. The plaque is signed to the lower right 'Emile Eckhart', the name of the artist at KPM. To the reverse, the plaque is impressed with sceptre mark and inscribed 'KPM'. It is housed within a giltwood frame carved with shells, scrolls and foliage. There are also various further inscriptions and sketches in French on the reverse side of the plaque.